On a rubbish heap filled with the discards of society, three tramps converge looking for food and a means of survival by any means. Initially suspicious of each other, and competing for scraps of food and comfort, the three are drawn together by their common situation and a grudging camaraderie is formed. When one tramp discovers a story book in the pile of rubbish, he is immediately drawn in by the story he reads. However, the other two are excluded from his world due to their illiteracy, so he endeavours to include them in the power and energy of the narrative and starts enacting it, drawing them closer together. 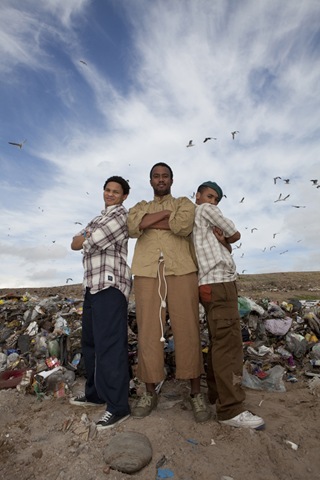 The three tramps explode the story on stage in a display of physical and visual performance, where the trash they live in is used to bring the story to life, and in this way build to a more satisfying life where culture, and narratives, have the potential to sustain life, and develop fragile bonds of friendship and togetherness. The story itself is an epic African yarn of coming of age, as a displaced boy grows up to become a man in a tribe that isn’t his, and is ultimately forced to deal with the very real issue of identity and family. At turns both tragic and highly comic, the play veers along a madcap path, and in doing so bonds the tramps like never before. From the depths of the rubbish, and the wasteland of their lives, they are able to eke out a sustenance and a dignity that will change their lives for the better. Created specifically for the demands of touring and being able to play in any space – be it theatre, school hall, or even outside – Tales From the Trash sees the development of FTH:K’s groundbreaking IPDP (Integrated Professional Development Programme) project. The experienced Marlon Snyders is joined onstage by new FTH:K trainees, Christopher Beukes and Tomri Steyn, in a casting that crackles with energy and vigour. For the first time in FTH:K touring, an all-Deaf cast presents a story for Deaf and hearing audiences, showcasing developed performance and theatre making skills. Running time of the show is 60 minutes, and in 2010 the cast and crew will take the work to KZN, Gauteng, Limpopo, and the Western Cape provinces.